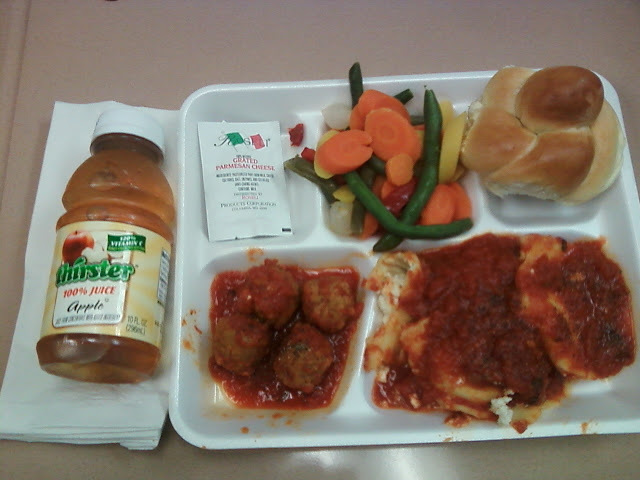 Contents: 100% orange juice, mixed veggies (Green Beans, Yellow/Orange carrots, pearl onions, red peppers), egg bread, turkey meatballs, cheese ravioli. Notes: Cost $4.75. Only complaint was that the sauce was too sweet. Looks pretty good! Is that kindof pricey? $4.75 is pricey for school lunch but it says it is a private school and it looks like they actually do some cooking. I wonder what the trade off is. Cost vs. Cooking?